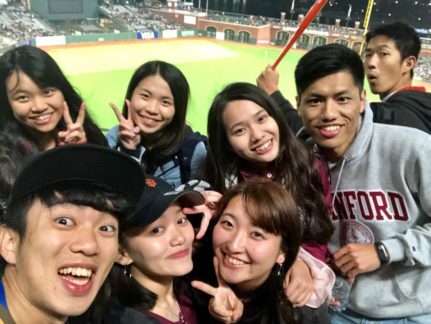 Devin (bottom left with his trademark smile) and friends from ALC enjoy a San Francisco Giants game. My name is Devin Tseng, I’m from Taiwan, and I participated in the American Language & Culture (ALC) Program in the summer of 2018. I am studying in Taichung now so most of the time I live there. I go back to my hometown, Yi-Lan, during the weekend and holidays. I am a fourth-year student at Feng Chia University 逢甲大學 majoring in International Business and Trade. I am currently working on a research project with five classmates designing more effective strategies to promote a company. When I am not studying or working on my research, I am also captain of our school’s tennis team. I teach tennis lessons, manage the school team, and plan games and other activities. In what ways has your VIA experience impacted who you are today? My VIA experience has impacted me in many ways. Most importantly, it taught me how to respect others in ways that I did not know how to before. Living in a dormitory taught me to respect my roommate and also others in common spaces. In my coordinator group and in my classes, I learned how to be a good listener and respect other people’s opinions—even those I did not agree with—so I could engage with them in a constructive way. VIA also taught me to be brave and not be afraid to say ‘yes’. Before the program, I was very reluctant to say yes and try new things, but now I am much more confident and willing to take risks. I understand how valuable the results can be. To be respectful of others and to be brave. VIA brings people together from many different backgrounds, and we were able to learn so much from each other, and try so many new experiences together. That was really a unique opportunity for all of us. It really opened our minds. My favorite memories from the ALC program were just seeing everyone with smiles on their faces. Everyone was always happy and laughing, it was a really positive environment. Yes, I am still very close with my friends from the program. We speak regularly on social media and meet up whenever we can. I am also working with the staff to organize alumni events here in Taiwan. We recently got together for a big reunion diner in Taipei which I helped plan. It’s very important to us to keep that community close. I am trying to work with a really young airline company. I really love the idea of working with an airline because you can meet so many people and help them travel, and I love seeing the joy that that brings people. Even if I had to volunteer to get started, I wouldn’t mind. I’m following that happiness. Keep and open mind, be ready to learn, be brave, and have fun. This will be one of the happiest and most rewarding experiences of your life. Family – VIA connects people and everyone treats each other like family. We look out for one another. Warm – We share everything and support each other. Hope – With a smile and an open mind, you can succeed in achieving your dreams.